Using transgenic mice that express a constitutively active version of STAT5b, we demonstrate that STAT5 plays a key role in governing B cell development and T cell homeostasis. STAT5 activation leads to a 10-fold increase in pro-B, but not pro-T, cells. Conversely, STAT5 signaling promotes the expansion of mature αβ T cells (6-fold increase) and γδ and NK T cells (3- to 4-fold increase), but not of mature B cells. In addition, STAT5 activation has dramatically divergent effects on CD8+ vs CD4+ T cells, leading to the selective expansion of CD8+ memory-like T cells and CD4+CD25+ regulatory T cells. These results establish that activation of STAT5 is the primary mechanism underlying both IL-7/IL-15-dependent homeostatic proliferation of naive and memory CD8+ T cells and IL-2-dependent development of CD4+CD25+ regulatory T cells. The ability to generate robust immune responses against all potential pathogens requires a large and diverse population of lymphocytes. On the other hand, lymphocyte numbers are constrained by the available space in the body and the energy requirements needed to maintain them. Thus, a balance must be struck between these processes, resulting in a pool of lymphocytes sufficient to deal with infectious agents effectively, yet not so large as to overwhelm the host organism. Abundant evidence has established that lymphocyte populations are, in fact, tightly regulated, such that similar organisms typically possess comparable numbers of lymphocytes. Furthermore, the relative distribution of lymphocytes into more specialized subsets, such as B cells or CD4+ and CD8+ T cells, is also tightly controlled (1, 2, 3, 4). This balance is governed both at the level of lymphocyte production in the bone marrow and thymus and by mechanisms in peripheral lymphoid organs that act to maintain lymphocyte numbers at steady state levels. Thus, conditions that induce transient lymphopenia result in proliferation of the remaining peripheral lymphocytes via a process termed homeostatic expansion (5, 6, 7, 8). Homeostatically proliferating cells exhibit characteristic changes in certain cell surface markers (CD44high, CD122high, Ly6Chigh), while others (CD69, CD25, CD62L) remain unchanged; interestingly, these alterations are identical with those observed in memory T cells (5, 9, 10). Over the last several years, substantial progress has been made in identifying the extrinsic factors that regulate the homeostasis of distinct lymphocyte populations. In general, these studies have pointed to a key role for the B cell receptor or TCR (1, 2). More recent work has indicated that cytokine receptors, particularly those that include the common γ-chain (γc)3 as an integral signaling component, also play an important role in the development, survival, and homeostatic proliferation of lymphocyte populations. This has been most clearly established for CD8+ T cells. Naive CD8+ T cells require signals sent by IL-7 and the IL-7R for survival in lymphocyte replete hosts and for homeostatic proliferation in lymphopenic environments (11, 12, 13). For memory CD8+ T cells, the cytokine IL-15 subsumes this role (14, 15, 16). The process is less clear for CD4+ T cells. Naive CD4+ T cells show similar requirements for IL-7 for survival and homeostatic proliferation (13, 17). In contrast, memory CD4+ T cells do not require any of the cytokines that signal through γc (including IL-2, IL-4, IL-7, IL-9, IL-15, and IL-21) for survival or homeostatic proliferation (18, 19). Whether other cytokines play a role in maintaining memory CD4+ T cell homeostasis is currently an area of ongoing investigation. A number of more specialized lymphocyte subsets also use IL-7, IL-15, or IL-2 for survival and homeostasis. This is most pronounced for γδ T cells, which are absolutely dependent on IL-7 for their development (20, 21, 22). NK T cells, a subset of T cells that appear to play an important role in bridging innate and adaptive immune responses, require IL-15 for survival and homeostasis (23, 24, 25). Similarly, CD4+CD25+ regulatory T cells, which are required to suppress immune responses and prevent autoimmunity, depend on IL-2 for their development into and/or survival as mature cells (26, 27, 28, 29, 30). In contrast, mature B lymphocytes do not appear to require γc-using cytokines for survival or homeostasis, but instead use cytokines of the TNF family, such as B cell activation factor (31). While γc cytokines have been clearly implicated in lymphocyte homeostasis, they stimulate numerous pathways involved in lymphocyte proliferation and survival; these pathways include the Ras/Raf/mitogen-activating protein kinase cascade, the activation of phosphatidylinositol 3-kinase (PI3K)-dependent pathways, and the activation of STAT3 and STAT5. Most work has focused on the role of pro- and anti-apoptotic regulators of the bcl-2 family and their potential induction by the PI3K/Akt signal transduction cascade (3, 32). In general, such studies have demonstrated that ectopic activation of the PI3K pathway does not mimic the effect of γc cytokines in inducing homeostatic proliferation of T lymphocytes. In contrast, little work has been performed on the role of STAT5 in this process. It has been shown that mice that lack both the STAT5a and STAT5b genes suffer from defects in growth hormone receptor signaling, increases in erythrocytes and granulocytes, infertility in females, and reduced postnatal viability (33). Subsequent analysis of the immune system in these mice demonstrated decreases in pro-B and pro-T cells as well as in common lymphoid progenitors (33, 34, 35, 36). Furthermore, all mature STAT5a/b−/− T cells exhibit an activated phenotype (CD44high, CD69+, CD62Llow), although they fail to proliferate following TCR stimuli, such as CD3 cross-linking (37). Hence, the proliferative defects and activated phenotype of T cells in STAT5a/b−/− mice have made it difficult to ascertain the role of this transcription factor in lymphocyte homeostasis. More recently, transgenic mice that overexpress wild-type STAT5b have been generated (38). In addition to demonstrating that STAT5b can substitute functionally for STAT5a, studies of these mice concluded that STAT5 also plays an important role in the homeostasis of CD8+ memory T cells. However, the role that STAT5 plays in regulating or initiating naive T cell homeostasis was not addressed, nor were effects reported on the homeostasis or development of NK T cells, γδ T cells, or B cells. Furthermore, these studies involved overexpression of wild-type STAT5b and not cytokine-independent activation of this pathway, so it remains unclear whether STAT5 activation alone is sufficient to induce homeostatic proliferation of CD8+ T cells. Therefore, to explore the role of STAT5 in homeostatic proliferation, we generated transgenic mice that express a constitutively activated form of STAT5 (called STAT5b-CA) in both B and T lymphocyte compartments. Expression of STAT5b-CA in transgenic mice resulted in distinct effects on all lymphocyte subsets. First, pro- and pre-B cells, but not mature B cells, are greatly increased in number. Second, NK T cell and γδ T cell populations are modestly expanded. Third, the number of CD8+ T cells in these mice is dramatically increased, and they display a cell surface phenotype identical with that of homeostatically proliferating or memory-like CD8+ T cells. Most significantly, we observe that STAT5b-CA CD8+ T cells no longer require IL-7 or IL-15 to undergo homeostatic proliferation, indicating that activation of the STAT5 pathway alone is sufficient to initiate a program of homeostatic expansion in CD8+ T cells. In contrast, CD4+ T cells show a minimal change in cell number, with the striking exception of CD4+CD25+ regulatory T cells. Thus, our results illuminate a key difference in the outcome of STAT5 activation in CD8+ vs CD4+ T cell lineages, namely, the preferential expansion of CD8+ memory or CD4+ regulatory T cells, respectively. STAT5b-CA cDNA was assembled by PCR-directed mutagenesis, subcloned into the p1026x expression vector (39), and then sequenced. STAT5b-CA transgenic mice were generated using standard procedures. Transgene-positive animals were identified by PCR and Southern blotting as previously described (39). Mice used for analysis were 6–15 wk old, except as otherwise noted. Since STAT5 activation has been suggested to play a role in tumorigenesis, we screened all mice for tumor formation. Less than 2% of all transgenic mice (four of >250 mice) developed tumors. Such mice were easily identifiable based on increased size of thymus and lymph nodes (>10-fold increase in cell number compared with nontransformed STAT5b-CA mice); all tumors expressed B220, exhibited monoclonal heavy chain gene rearrangements, and lacked all other lymphoid markers (CD3−, DX5−, CD4−, CD8−, IgM−), except CD19 (two of three tumors examined). These mice were excluded from all analyses. All animal experiments were approved by the University of Minnesota institutional animal care and use committee. PL (Thy1.1+) TCR transgenic mice were maintained in our breeding colony on a C57BL/6 background. IL-15−/− mice (obtained from Immunex via Taconic Farms, Germantown, NY) were also maintained on a C57BL/6 background. IL-7−/− × recombinase-activating gene-2 (rag-2)−/− mice were provided by DNAX (Palo Alto, CA) via Dr. L. LeFrancois, while IL-7−/− × IL-15−/− mice were generated by intercrossing IL-7−/− and IL-15−/− mice (backcrossed six times to C57BL/6). STAT5a/b−/− mice were obtained from Dr. J. Ihle via Dr. D. Largaespada. β2-Microglobulin−/− and Rag-2−/− mice were obtained from Taconic Farms. CD4+ and CD8+ T cells, B220+ B cells, and nonlymphoid cells were isolated using magnetic bead separation (Miltenyi Biotech, Auburn, CA) according to the manufacturer’s instructions. In some cases further purification was conducted by cell sorting on a FACSVantage DIVA (BD Biosciences, Mountain View, CA). Total RNA was prepared from these purified cell populations using the RNeasy kit (Qiagen, Valencia, CA). For transfer experiments, CD8+CD44low naive T cells were obtained by negative selection, labeled for 10 min with CFSE, and introduced into sublethally irradiated mice (600 rad) by tail vein injection as previously described (5). Eight days later, host mice were sacrificed, and spleens were removed for analysis by flow cytometry. Spleen, thymus, and lymph nodes were isolated, and single-cell suspensions were generated. RBC were removed from spleen preparations by ammonium chloride lysis. Bone marrow cells were obtained as previously described (39). Cells were then stained with a panel of Abs (listed below) and analyzed on a FACSCalibur (BD Biosciences). Abs directed against the following markers were obtained from eBioscience (San Diego, CA): CD3 (2C11), CD4 (GK1.5), CD8 (53-6.7), CD11a (M17/4), CD11b (M1/70), CD19 (MB19-1), CD24(M1/69), CD25 (PC61.5), CD44 (IM7), B220 (RA3-6B2), CD45RB (C363.16A), CD62L (MEL-14), CD69 (H1.2F3), CD117 (2B8), CD122 (5H4), CD127 (A7R34), I-Ab (M5/114.15.2), TCR γδ (UC7–13D5), BP-1 (FG35.4), pan-NK (DX5), NK1.1 (PK136), GR-1 (RB6-8C5), IgD (11-26), and IgM (1B4B1). Additional Abs directed against the following cell surface markers were obtained from BD Phar-Mingen (San Diego, CA): CD43 (S7), CD132 (4G3), CD25 (7D4), Thy1.1 (OX-7), Vα2 TCR (B20.1), and Vβ5 (MR9-4). Anti-Ly6C Abs (HK1.4) were obtained from Southern Biotechnology (Birmingham, AL). Analysis of flow cytometry data was conducted using FloJo software (TreeStar, San Carlos, CA). A two-step procedure was used to carry out real-time PCR assays. First, RNA was converted to cDNA using the Brilliant Two-Step Quantitative RT-PCR Core Reagent Kit (Stratagene, La Jolla, CA). Aliquots of cDNA were then used with reagents from the same kit in real-time PCR assays using a Smartcycler (Cepheid, Sunnyvale, CA). Reactions for hypoxanthine phosphoribosyltransferase (HPRT), bcl-xL, and the STAT5b-CA transgene were conducted for one cycle at 95°C for 15 min, followed by 45 cycles at 60°C (50 s) and 95°C (15 s). Similar conditions were used for pim-1, except the annealing/extension temperature was 64°C. foxp3 assays were conducted as described by Khattri et al. (40). Serial dilutions of RNA were used to establish standard curves and permitted quantitation of relative levels of RNA expression. Oligonucleotides and TaqMan probes were obtained from IDT (Coralville, IA) and are listed as follows: 5′ STAT5b-CA primer, TTGGAAACAATACTCGTAATGTGA; 3′ STAT5b-CA primer, CGGGAGCCTGTAGCCAT; STAT5b-CA probe, TET-CCTGTGGACAGCTCACCTAGCTGC-BHQ1; 5′ pim-1 primer, TC AAGGACACAGTCTACACGG; 3′ pim-1 primer, AGCGATGGTAGCG AATCC; pim-1 probe, FAM-TGGGACCCGAGTGTACAGTCCTCBHQ1; 5′ bcl-xL primer, CTGCTTGCTGTCGCCG; 3′ bcl-xL primer, TGGGTCTGCTCTGTGTTTAGC; bcl-xL probe, FAM-CCTTATCTTGGCTTTGGATCCTGGAAG-BHQ1; 5′ HPRT primer, GGTGAAAAGGACCTCTCGAA; 3′ HPRT primer, AGTCAAGGGCATATCCAACA; and HPRT probe, ROX-TGTTGGATTTGAAATTCCAGACAAGTTTGT-BHQ2. Splenocytes were isolated by disrupting spleens between ground glass slides. Cells were subsequently resuspended in RPMI (CellGro; Mediatech, Herndon, VA) containing 10% FCS (Gemini BioProducts, Woodland, CA), 50 μM 2-ME (Sigma-Aldrich, St. Louis, MO), 1% l-glutamine (CellGro), 1 mM sodium pyruvate (CellGro), 10 mM HEPES (CellGro), and 1% streptomycin/penicillin (CellGro). One hundred thousand cells per well were seeded into 96-well, round-bottom plates. Cells were either placed in 200 μl of medium alone or stimulated in an equal volume with CD3-coated latex beads, CD3/B7.1-coated beads, or CD3-coated beads plus IL-2 (40 U/ml), IL-2 alone (40 U/ml), IL-7 alone (10 ng/ml), or IL-15 alone (10 ng/ml). CD3- and CD3/B7.1-coated beads were made as previously described (41). IL-2 was obtained from the National Institutes of Health (Bethesda, MD); IL-7 and IL-15 were obtained from PeproTech (Rocky Hill, NJ). Cells were incubated for 48 h at 37°C in a 5% CO2 incubator. [3H]thymidine (0.4 μCi/well) was then added to cultures, and incubation was continued for an additional 16 h. Cells were harvested on a 96-well harvester (Skatron, Molecular Devices, Sunnyvale, CA), and incorporated counts were determined using a beta plate counter (Wallac, Gaithersburg, MD). Proliferation assays with CFSE-labeled splenocytes were conducted as described above, except that APC and CD3 Abs (0.5 μg/ml) were used to stimulate cells rather than CD3-coated latex beads. Proliferation assays with purified CD8+ T cells were conducted as described above, except that fewer cells were used (40,000 or 50,000/well). Purified CD8+ T cells were obtained by negative selection using magnetic bead columns (Miltenyi Biotech, Auburn, CA). Cells were stained with FITC-conjugated CD4, B220, I-Ab, CD11b, and GR-1 to deplete non-CD8+ T cells. To test for CD4+CD25+ suppressor activity, we conducted coculture experiments with CD4+CD25− T cells (from littermate control mice (LMC) mice) and CD4+CD25+ (from LMC and STAT5b-CA mice). CD4+CD25+ and CD4+CD25− T cells were obtained by staining purified CD4+ T cells with CD25-PE and anti-PE magnetic beads, followed by column separation. In some instances CD4+CD25+ and CD4+CD25− T cells were further purified by flow cytometry. Purity was assessed by flow cytometry on a FACSCalibur (BD Biosciences) and was typically >96% for all cell populations. Purified CD4+CD25− T cells (50,000 cells/well) were incubated with 100,000 irradiated APC (T cell-depleted splenocytes) and anti-CD3 Ab (2C11; 0.5 μg/ml). Different amounts of purified CD4+CD25+ T cells from either LMC or STAT5b-CA mice were added at CD4+CD25+/CD4+CD25− ratios of 1/27, 1/9, 1/3, and 1/1. Both CD4+CD25+ populations were >96% pure. Cultures were incubated for 72 h at 37°C; 0.4 μCi of [3H]thymidine was then added to each well, and the assay was incubated for an additional 16 h. Proliferation assays were harvested, and incorporated counts were determined as described above. Maximal proliferation was determined to be that seen in CD4+CD25− T cells stimulated with APC and CD3 Ab alone. Whole cell lysates were prepared as previously described. Proteins were fractionated by SDS-PAGE and transferred to polyvinylidene difluoride membranes. Blots were probed as previously described (42). Anti-phopho-STAT5 Abs (Cell Signaling Technologies, Beverly, MA) diluted 1/1000 were used to detect activated STAT5 protein. Work by Kitamura and colleagues (43) has demonstrated that STAT5b can be rendered active by replacing histidine 299 and serine 711 with arginine and phenylalanine, respectively. Mutation of STAT5b in this manner results in the constitutive phosphorylation of tyrosine 699, thereby mimicking the process by which wild-type STAT5 is activated. This construct has been shown to induce a number of STAT5 target genes, such as bcl-xL, in cell culture models (44). Based on these results, we generated a STAT5b transgene expression vector, incorporating the His-299→Arg and Ser-711→Phe replacements, which we refer to as STAT5b-CA (for Constitutively Active; Fig. 1⇓A). The expression of this transgene is restricted to T and B lymphocytes by a compound promoter/enhancer cassette consisting of the lck proximal promoter and the Eμ enhancer (Fig. 1⇓B). Construction and expression of STAT5b-CA transgene. A, Schematic diagram of STAT5b-CA transgene, showing the locations of His→Arg and Ser→Phe point mutations. B, Diagram of STAT5b-CA transgene expression vector. An ∼1-kb genomic DNA fragment containing the Eμ enhancer (shown in black) is inserted into the lck proximal promoter (light stipples) and drives expression in B and T lymphocytes. The human growth hormone gene (dense stipples) provides a source of introns and a polyadenylation sequence. C, Relative expression of STAT5b-CA transgene. 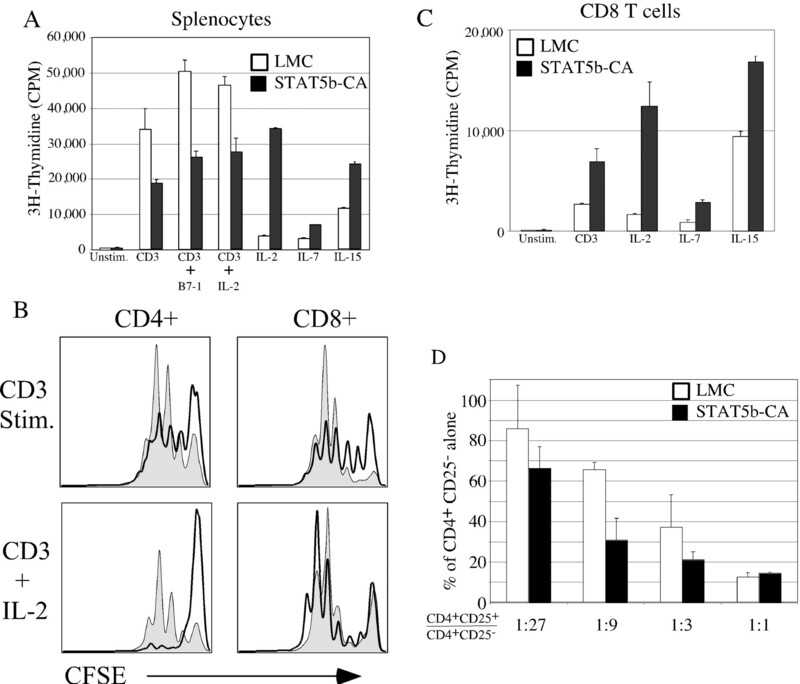 Spleens from STAT5b-CA transgenic and LMC mice were harvested, and CD4+and CD8+ T cells, B220+ B cells, and nonlymphoid cells (B220- and CD3-negative) were purified by magnetic bead selection and subsequent cell sorting. Cell purity after sorting was >97%. RNA prepared from sorted cells was converted to cDNA and used in a TaqMan PCR assay to quantitate levels of transgene. No signal was detected in samples in which no reverse transcriptase was included in the reaction (No RT controls). Relative expression values were obtained after normalization using an HPRT TaqMan assay. D, Expression of activated STAT5 in whole cell lysates from purified CD4+ and CD8+ T cells were probed with Abs to phospho-STAT5. Equivalent loading was confirmed by probing with Abs to extracellular signal-regulated kinase 1/2 (data not shown). Five different founder mice, which displayed a large range in transgene copy number (data not shown), were examined. Of these five, the three founders exhibiting the highest copy number developed skin lesions behind the shoulder by 3–6 wk of age. These mice were sacrificed at 4 wk (two founders) or 12 wk of age (one founder), and lymphoid organs were characterized by flow cytometry. All three founders showed massive increases in lymphocyte number (20-fold increase in splenocytes and lymph node cells; data not shown), particularly CD8+ αβ T cells, NK T cells, and γδ T cells. The remaining two founders differed in that they lacked the skin lesions, but otherwise displayed a similar, although less severe, phenotype (∼5-fold increase in spleen and lymph node cell numbers; Fig. 2⇓A). One of these latter two founders was fertile and was used to establish the STAT5b-CA transgenic line described below. STAT5b-CA expression alters lymphocyte development and homeostasis. A, Bone marrow (BM), thymus, spleen, and lymph nodes (LN) were harvested from 6- and 12-wk-old mice, and total cell numbers were determined by counting using trypan blue exclusion. For spleen samples, RBC were first lysed with ammonium chloride. Results shown are the mean ± range and are representative of five experiments. B, Thymus and bone marrow from 6-wk-old STAT5b-CA transgenic (Tg) and LMC mice were stained with Abs to CD4, CD8, B220, and IgM to identify lymphocyte developmental subsets. Four similar experiments were conducted with mice ranging in age from 6–15 wk (two to four mice per group in each experiment). C, Splenocytes from 6-wk-old STAT5b-CA transgenic and LMC mice were stained with markers to 1) B220 and CD3 to identify B and T cells, 2) CD4 and CD8 to identify these subsets of T cells, and 3) NK1.1 and CD3 to identify NK and NK T cells. Similar results were obtained in four separate experiments. We first confirmed expression of the STAT5b-CA transgene by carrying out real-time PCR assays on RNA from purified T cells, B cells, and nonlymphoid cells (CD3−,B220−). As shown in Fig. 1⇑C, mature CD4+ and CD8+ T cells possessed equivalent levels of STAT5b-CA mRNA, while B220+ cells expressed ∼6-fold higher levels. In contrast, we detected 1/50th the level of transgene mRNA in nonlymphoid cells. This baseline signal corresponds to the amount we would expect to detect, since the sorted nonlymphoid population still contains ∼2% lymphocytes. Hence, we conclude that STAT5b-CA expression is restricted to B and T lymphocytes. Additional RT-PCR experiments detected STAT5b-CA in immature T cells (double negative (DN) thymocytes) and B cells (bone marrow pro/pre-B cells), indicating that the transgene is expressed throughout lymphocyte development (data not shown). Finally, Western blotting experiments confirmed that B cells as well as CD4+ and CD8+ T cells expressed elevated levels of active phospho-STAT5 in STAT5b-CA mice (Fig. 1⇑D and data not shown). Mice that lack both STAT5a and STAT5b have fewer pro-B and pro-T cells and are completely devoid of γδ T cells (34, 37). Therefore, we examined whether STAT5b-CA transgenic mice showed perturbations in lymphocyte development. As shown in Fig. 2⇑A, 6-wk-old STAT5b-CA mice show a 2- to 3-fold increase in bone marrow cellularity. As these mice age, bone marrow cellularity decreases, such that by 9–10 wk of age, transgenic and LMC have comparable numbers of cells. However, mice of all ages exhibited a similar increase in B-lineage cells in the bone marrow. In particular, we noted a dramatic increase in the number of pro- and pre-B cells (5-fold; Table I⇓). This was most noticeable for late pro-B cells (CD19+, CD43+, BP-1+; Hardy fraction C), which were increased 10-fold (data not shown). In contrast, immature B cells showed a less striking increase (2.5-fold), while mature B cell numbers were similar or, in some cases, slightly lower than those seen in the bone marrow of LMC mice. Unlike the changes in the bone marrow, we observed minimal alterations in thymocyte numbers in 6-wk-old STAT5b-CA mice. However, 9- to 15-wk-old mice exhibited a progressive decline in total thymocytes (Fig. 2⇑A). This primarily reflects a change in double-positive cells, which fell from 66% of total thymocytes in 6-wk-old mice to ∼40 or ∼25% in 12- and 15-wk-old mice, respectively (Fig. 2⇑B and data not shown). In addition, both young and old mice exhibited variable increases in mature CD8+ single-positive (SP) thymocytes that ranged from 2.5- to 5.4-fold relative to LMC (Table I⇑ and data not shown). In contrast, DN and CD4+ SP thymocytes showed minimal increases in cell numbers (Table I⇑). Furthermore, although the DN compartment is modestly enlarged in STAT5b-CA mice, we did not observe an increase in CD44+CD25+ or CD44−CD25+ pro-T cells (data not shown). These results suggest that STAT5 activation is differentially required for B and T cell development, being far more critical for early B cell development. We also examined the effect of STAT5 activation on γδ and NK T cell development. Previous studies, using fetal thymic organ culture systems, demonstrated that STAT5 is sufficient to drive γδ T cell development in the absence of IL-7R-dependent signals. These studies suggested that STAT5 plays a key role in governing the development of this T cell lineage (45). Consistent with these reports we observed a modest increase in the number of γδ T cells in the thymus of STAT5b-CA mice (∼2-fold), thereby confirming STAT5’s role in driving γδ T cell differentiation in an in vivo setting (Table I⇑). Likewise, NK T cells in STAT5b-CA mice also exhibited modest increases in cell number compared with LMC mice (∼2-fold increase; Table I⇑). We next examined γδ and NK T cells as well as B lymphocytes in the spleen and lymph nodes of STAT5b-CA mice. The percentages of γδ and NK T cells in these organs were roughly similar in wild-type and STAT5b-CA transgenic mice (Fig. 2⇑C and data not shown). However, total numbers of γδ and NK T cells in the spleen were increased ∼3.5- and 4.5-fold, respectively (Table I⇑). Similar results were seen in lymph nodes (data not shown). Splenic B cells also showed a modest increase in cell numbers; interestingly, this appeared to be restricted largely to immature B cells (IgMhigh, IgDlow, 4- to 8-fold increase) and not mature B cells (IgMlowIgDhigh; <2-fold increase; Table I⇑ and data not shown). These results suggest that the increase in peripheral B cell numbers is secondary to the increase in B cell progenitors produced in the bone marrow. Since STAT5 activation affects T cell development, we proceeded to determine whether it also alters mature CD4+ and CD8+ T cell homeostasis. Total T cell numbers in the spleen from STAT5b-CA transgenic mice were greatly increased relative to littermate controls at all ages examined (6–15 wk of age; Fig. 2⇑A). Similar results were observed in the lymph nodes of STAT5b-CA mice (data not shown). CD8+ T cells showed the most dramatic increase in cell numbers (∼15-fold increase; Table I⇑), resulting in a reversal of the CD4/CD8 ratio in all peripheral lymphoid organs (Fig. 2⇑C). These CD8+ T cells also showed profound differences in cell surface marker expression relative to LMC. Specifically, we observed that almost all CD8+ T cells in STAT5b-CA mice express high levels of CD44, CD122 (IL2R β-chain) and Ly6C, and hence resemble either memory CD8+ T cells or naive CD8+ T cells that are undergoing homeostatic proliferation (Fig. 3⇓A). Consistent with this hypothesis, we observed that STAT5b-CA CD8+ T cells also expressed higher levels of the adhesion molecule LFA-1, an integrin that is up-regulated on homeostatically expanding CD8+ T cells (data not shown). Importantly, this increase in surface marker expression does not reflect changes in cell size, as STAT5b-CA and LMC cells exhibited comparable forward and side scatter profiles when examined by flow cytometry (data not shown). Furthermore, STAT5b-CA CD8+ T cells did not show increases in CD25 or CD69 expression, nor did they down-regulate CD62L (L-selectin; Fig. 3⇓B); these findings eliminate the possibility that STAT5 activation simply results in the generation of acutely activated, CD8+ effector T cells. Thus, by all surface marker criteria established to date, CD8+ T cells in STAT5b-CA mice are indistinguishable from homeostatically proliferating or memory CD8+ T cells. STAT5 activation leads to distinct alterations in cell surface marker expression on CD4+ and CD8+ T cells. A and B, Splenocytes from 6-wk-old mice were stained with Abs to CD4 and CD8 to identify T cell subsets, in conjunction with a panel of Abs against the cell surface markers CD44, CD122 (IL2R β-chain), and Ly6C (A) or CD62L (L-selectin), CD25 (IL-2R α-chain), and CD69 (B). The top and bottom rows depict histograms of CD8- and CD4-gated cells, respectively, stained with the Abs listed above. Gray histograms show LMC mice; black-outlined histograms show STAT5b-CA mice. Shown is a representative example of four or more separate experiments. Similar results were consistently seen with cells obtained from pooled axial, brachial, and inguinal lymph nodes (data not shown). C, Splenocytes from LMC and STAT5b-CA mice were stained with Abs to CD4, CD45RB, and CD25. Panels show CD45RB vs CD25 distribution of CD4-gated splenocytes. D and E, Thymocytes from LMC, STAT5b-CA and STAT5a/b−/− mice were stained with fluorescently labeled CD8, CD4, and CD25 Abs and analyzed by flow cytometry. Shown are CD25 expression levels on gated CD4 SP thymocytes. F, RNA was harvested from purified CD4+CD25− and CD4+CD25+ T cells (>90% pure), and real-time PCR assays were conducted for foxp3 and HPRT to quantitate relative expression levels (±SEM). Similar results were obtained in two separate experiments. G, RNA was harvested from CD4+ T cells obtained from STAT5a/b−/− or heterozygous STAT5a/b+/− mice, and real-time PCR reactions were conducted as described in Fig. 3⇓F. Results are depicted as relative foxp3 expression ± SEM. Shown is a representative example of two experiments. STAT5 activation leads to a strikingly different effect on CD4+ T cells. First, total numbers of CD4+ T cells in STAT5b-CA mice are increased to a much lesser degree (∼2.5-fold increase; Table I⇑). Second, we saw minimal differences in the expression of CD44, CD122, and LFA-1 on CD4+ T cells from STAT5b-CA mice compared with littermate controls (Fig. 3⇑A and data not shown). Ly6C was up-regulated on a subpopulation of STAT5b-CA CD4+ T cells. However, the increase was always much smaller than that observed for STAT5b-CA CD8+ T cells (Fig. 3⇑A). CD62L and CD69 levels were also unchanged on STAT5b-CA CD4+ T cells, indicating that STAT5 activation does not lead to the generation of activated CD4+ T cells (Fig. 3⇑B). In contrast, the percentage of CD4+ T cells that express CD25 increased from 15% in littermate controls to 42% in STAT5b-CA mice (Fig. 3⇑, B and C). Hence the increase in CD4+ T cells in STAT5b-CA mice occurred predominantly in CD4+CD25+, and not CD4+CD25−, T cell populations (6- vs <2-fold increase; Table I⇑). Furthermore, CD4+CD25+ T cells in STAT5b-CA mice also displayed lower levels of CD45RB (Fig. 3⇑C) and hence by cell surface marker expression resembled regulatory or suppressor T cells (46). Importantly, both RT-PCR and Western blotting experiments confirmed that CD4+CD25− and CD4+CD25+ T cells express equivalent levels of STAT5b-CA mRNA and phospho-STAT5b protein (data not shown). To confirm that the CD4+CD25+ T cells we observed are regulatory T cells, we purified CD4+CD25+ T cells from STAT5b-CA and LMC mice. We then conducted RT-PCR assays to quantitate the expression of foxp3, a transcription factor that has been described as a master regulator and unique marker for regulatory T cells (40, 47, 48). 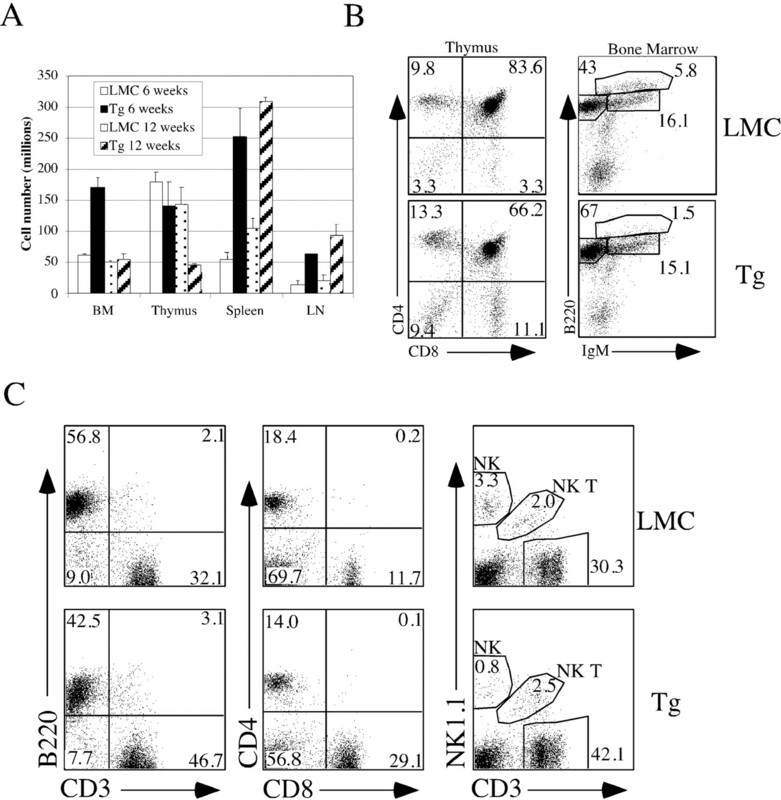 As expected, CD4+CD25+ T cells expressed 30-fold more foxp3 than CD4+CD25− T cells in LMC mice (Fig. 3⇑F). 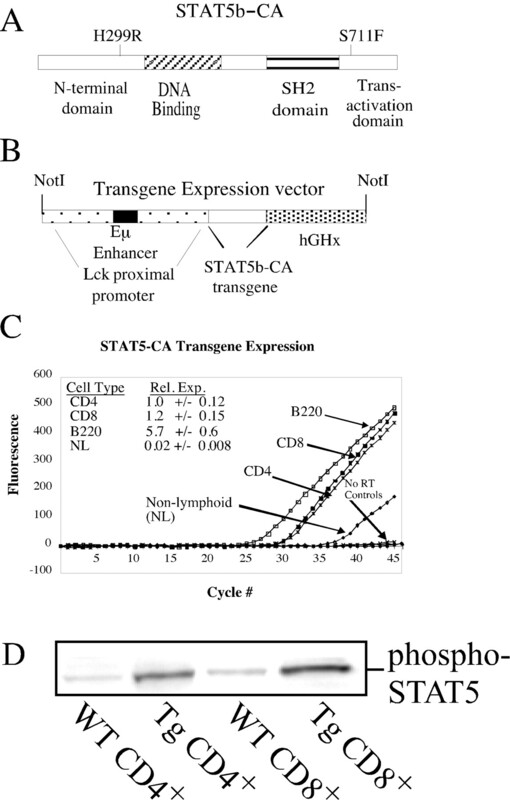 CD4+CD25+ T cells from STAT5b-CA mice exhibited a similar increase in foxp3 expression relative to CD4+CD25− T cells (Fig. 3⇑F). These results suggest that STAT5 activation may be required for the generation of CD4+CD25+ regulatory T cells. Supporting this view, we found that CD4+CD25+ T cells were greatly increased in the thymus of STAT5b-CA mice (Fig. 3⇑D). Conversely, STAT5a/b−/− mice had virtually no detectable CD4+CD25+ T cells in either thymus (Fig. 3⇑E) or spleen (data not shown). This latter result could be the result of STAT5’s potential role in governing CD25 expression or might reflect a more profound role for STAT5 in the development of regulatory T cells. We reasoned that if regulatory T cells were truly absent in STAT5a/b−/− mice, then foxp3 expression should be decreased in CD4+ T cells from these mice relative to LMC. To test this possibility we sorted CD4+ T cells from the spleens of STAT5a/b−/− and LMC and conducted RT-PCR assays to quantitate foxp3 expression. These experiments demonstrated that foxp3 levels were dramatically reduced (7.1-fold decrease) in STAT5a/b−/− mice relative to LMC (Fig. 3⇑G). Based on our observations that CD4+CD25+ T cells express ∼30-fold more foxp3 than CD4+CD25− T cells (see Fig. 3⇑F), and that CD4+CD25+ T cells comprise ∼15% of total splenic CD4+ T cells (see Fig. 3⇑C), one would predict that if STAT5a/b−/− mice lack CD4+CD25+ regulatory T cells, then foxp3 levels in STAT5a/b−/− CD4+ T cells should be ∼16% of those observed in wild-type CD4+ T cells. This value closely matches our experimentally determined result of 14% (i.e., 1/7.1), suggesting that STAT5a/b−/− mice lack regulatory T cells. Thus, STAT5 activation not only promotes the expansion of regulatory-like T cells, but is also absolutely required for their development. Since CD8+ T cells from STAT5b-CA mice show striking similarity to homeostatically proliferating cells, we determined whether STAT5 activation was sufficient to drive homeostatic expansion of these cells in the absence of IL-7. To address this question, we used OT-1 TCR transgenic mice. OT-1 T cells express CD8 and a TCR comprised of Vα2 and Vβ5 (49). This TCR recognizes an OVA peptide in the context of H-2Kb. Therefore, OT-1 mice that have not been exposed to OVA should contain predominantly naive OT-1 T cells. Previous studies have demonstrated that OT-1 T cells undergo homeostatic proliferation when transferred into lymphopenic mice (either rag-1−/− or sublethally irradiated wild-type mice) (5, 7, 13). This process absolutely requires IL-7, as OT-1 T cells do not proliferate in lymphopenic mice that lack this cytokine (12). Thus, this system should allow us to test whether STAT5 activation alone is sufficient to replace IL-7 in the process of homeostatic proliferation. To carry out this experiment, we first crossed STAT5b-CA transgenic mice to OT-1 TCR transgenics. STAT5b-CA × OT-1 mice exhibit many of the characteristics of STAT5b-CA transgenic mice, including a greatly enlarged population of CD8+ T cells relative to OT-1 controls. Furthermore, most of these T cells expressed high levels of CD44, CD122, and Ly6C (data not shown). However, a small percentage of CD8+ T cells in STAT5b-CA × OT-1 transgenics expressed low levels of these activation markers and therefore are considered naive T cells. We isolated these naive CD8+CD44low T cells from both OT-1 and STAT5b-CA × OT-1 mice. Subsequent analysis of these purified populations indicated that cells from OT-1 mice were 90% CD8+ (CD8+CD44high population, <2.5%) and those from STAT5b-CA × OT-1 mice were 98% CD8+ (CD8+CD44high population, <0.6%). These purified cell populations were pooled and labeled with CFSE to allow us to track cell division. Equal numbers of CFSE-labeled OT-1 and STAT5b-CA × OT-1 T cells were injected into sublethally irradiated LMC, IL-7−/−, or IL-7−/− × IL-15−/− mice. OT-1 and STAT5b-CA × OT-1 T cells could be distinguished by differential expression of the congenic markers Thy1.1 and Thy1.2. This approach allowed us to directly compare homeostatic expansion of OT-1 and STAT5b-CA × OT-1 T cells in identical host environments. As expected, both OT-1 (Thy1.1+) and STAT5b-CA × OT-1 (Thy1.1−) T cells underwent homeostatic expansion in wild-type mice, although STAT5b-CA × OT-1 T cells proliferated more vigorously than OT-1 T cells (Fig. 4⇓). In contrast, only STAT5b-CA × OT-1 T cells proliferated in IL-7−/− mice (Fig. 4⇓). Likewise, STAT5b-CA × OT-1 T cells, but not OT-1 T cells, also underwent homeostatic proliferation in IL-7−/− × IL-15−/− mice (Fig. 4⇓). Importantly, STAT5b-CA × OT-1 T cells transferred into IL-7−/− × IL-15−/− hosts proliferated as well as wild-type OT-1 T cells transferred into wild-type hosts (compare Fig. 4⇓, left and right panels). Similar results were observed when transferring polyclonal CD8+ CD44low T cells from STAT5b-CA mice into IL-7−/− × rag-2−/− mice (data not shown). Hence induction of homeostatic expansion by STAT5b-CA expression is not a phenomenon unique to OT-1 T cells. These results demonstrate that STAT5 activation alone is sufficient to initiate cytokine-independent homeostatic expansion of CD8+ T cells. STAT5 activation is sufficient to initiate homeostatic expansion of CD8+ T cells in the absence of IL-7 and IL-15. Spleens and lymph nodes from OT-1 TCR transgenic mice (Thy 1.1+) and OT-1 × STAT5b-CA transgenic mice (Thy1.1−) were harvested, and naive CD8+ T cells were purified as described in Materials and Methods. Equal numbers of purified control and STAT5b-CA cells were pooled and labeled with CSFE; 2.5 million cells were then injected into sublethally irradiated, wild-type, IL-7−/−, or IL-7−/− × IL-15−/− mice, respectively. Eight days later recipient mice were sacrificed, and their spleens were removed. Splenocytes were stained with Abs to Vα2 and Vβ5 to identify OT-1 transgenic T cells and then were analyzed by FACS to quantitate CSFE dye dilution. Panels depict Vα2/Vβ5-gated cells. Abs to Thy1.1 distinguished OT-1 and STAT5b-CA × OT-1 T cells. Shown is a representative of two experiments. We have also explored whether STAT5b-CA expression allows OT-1 T cells to undergo homeostatic expansion in the absence of TCR signals. We found that in the absence of MHC class I molecules, (β2-microglobulin−/−) STAT5b-CA × OT-1 T cells still undergo homeostatic expansion, although at a greatly reduced rate (data not shown). These results are consistent with the findings of Seddon and Zamoyska (50) that TCR and IL-7 signals synergize to promote homeostatic proliferation. However, they also observed that these pathways can operate independently in driving homeostatic proliferation, albeit less effectively. One potential mechanism by which STAT5 activation could promote CD8+ T cell proliferation or accumulation is by up-regulating cell cycle activators or cell survival genes. To test this hypothesis directly, we looked at mRNA levels for bcl-xL in CD8+ T cells. Since STAT5b-CA transgenic mice express different percentages of naive (CD44low) and memory (CD44high) T cells, we isolated purified CD44low and CD44high CD8+ T cells from both STAT5b-CA and LMC mice. Minimal differences were seen in bcl-xL gene expression when comparing CD44low naive T cells. In contrast, bcl-xL mRNA levels were increased 17-fold in freshly isolated CD44high STAT5b-CA CD8+ T cells compared with LMC mice (Fig. 5⇓A); Similar results were seen for pim-1, a gene whose expression correlates with cell proliferation (51). As shown in Fig. 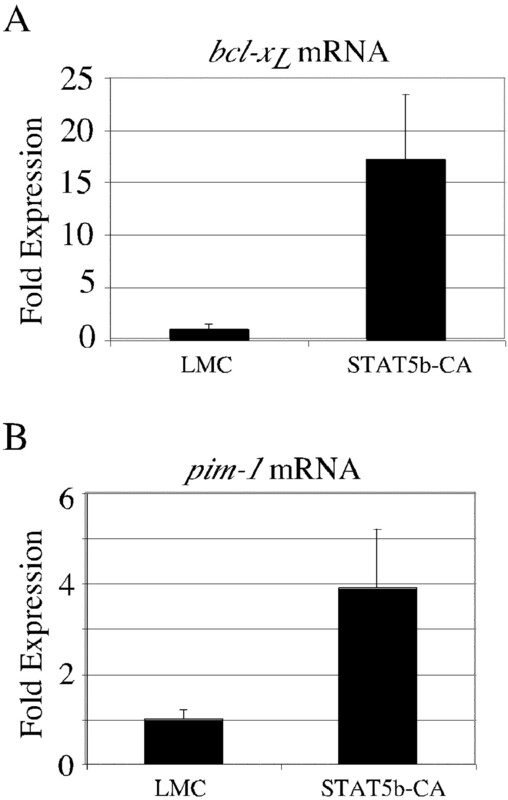 5⇓B, pim-1 mRNA was increased 3.9-fold in CD44highCD8+ STAT5b-CA T cells relative to LMC. Thus, STAT5 activation alters the expression of a subset of genes involved in promoting cell cycle entry and survival. STAT5 activation induces genes involved in regulating cell cycle and survival. A and B, RNA was harvested from purified CD44high, CD8+ T cells (>90% pure), and real-time RT-PCR assays were conducted for bcl-xL, pim-1, and HPRT to quantitate relative expression levels. Relative expression levels of bcl-xL (A) and pim-1 (B) mRNA are plotted following normalization to HPRT transcript levels. Similar results were obtained in two separate experiments. These results suggested that STAT5b-CA T cells might be more responsive to TCR- or cytokine-dependent signals. To examine this possibility, we stimulated splenocytes from wild-type and STAT5b-CA mice with CD3-coated latex beads and measured cell proliferation using a [3H]thymidine incorporation assay. Two important results emerged from these experiments. First, splenocytes from LMC and STAT5b-CA mice failed to proliferate in the absence of stimulation (Fig. 6⇓A). Importantly, this demonstrates that STAT5b-CA T cells do not spontaneously produce γc cytokines, such as IL-2, IL-7, or IL-15. These results correlate with our observations that serum levels of IL-2 and IL-7 are not elevated in STAT5b-CA mice. Thus, they retain requirements for some external signals to enter cell cycle. Second, splenocytes from STAT5b-CA mice actually proliferated significantly less well than those from LMC mice in response to TCR engagement (Fig. 6⇓A). Supplementation of these cultures with exogenous IL-2 or addition of the costimulator B7-1 significantly enhanced the proliferation of LMC cells, but had a less impressive effect on STAT5b-CA T cells (Fig. 6⇓A). In contrast, we found that STAT5b-CA splenocytes were uniformly more responsive to stimulation with the cytokines IL-2, IL-7, and IL-15 (Fig. 6⇓A). Similar results were obtained using CFSE to measure cell proliferation. Following anti-CD3 stimulation, both CD4+ and CD8+ STAT5b-CA T cells underwent significantly fewer rounds of cell division compared with littermate controls (Fig. 6⇓B). Importantly, stimulation with CD3 and IL-2 reversed the hyporesponsiveness of STAT5b-CA CD8+, but not CD4+ T cells. STAT5b-CA transgenic mice show alterations in CD4+ and CD8+ T cell proliferation following TCR or cytokine stimulation. A, Spleens from STAT5b-CA or LMC mice were harvested and set up in proliferation assays. One hundred thousand splenocytes were placed in culture with medium alone (unstim.) or stimulated with CD3-coated beads (CD3), CD3- and B7-1-coated beads (CD3 + B7-1), CD3-coated beads plus 40 U/ml of IL-2 (CD3 + IL-2), 40 U/ml of IL-2 alone (IL-2), 10 ng/ml of IL-7 alone (IL-7), or 10 ng/ml of IL-15 alone (IL-15). Proliferation assays were harvested 60 h later. Data represent the mean ± SD of triplicate samples. Similar results were seen in separate experiments with two LMC or five STAT5b-CA mice, respectively. B, Spleens from wild-type and STAT5b-CA mice were labeled with CFSE and set up in proliferation assays. One hundred thousand splenocytes were stimulated with medium alone, CD3 Ab (0.5 μg/ml), or CD3 plus IL-2 (40 U/ml). Three days later cells were stained with Abs to CD4 and CD8 and analyzed by flow cytometry to assess cell division as measured by CFSE dye dilution. Gray histograms show LMC mice; black-outlined histograms show STAT5b-CA mice. C, CD8+ T cells were purified from spleens of control or STAT5b-CA transgenic mice using magnetic bead negative selection (>90% CD8+). Proliferation assays were conducted as described in A, except 40,000 cells/well were used instead of 100,000. D, CD4+CD25− T cells from LMC mice were purified using magnetic beads, followed by cell sorting, and then were seeded in a 96-well plate at 50,000 cells/well. One hundred thousand APC plus 0.5 μg/ml anti-CD3 Abs were added per well to stimulate the proliferation of LMC CD4+CD25− T cells. For inhibition assays, different numbers (1,850–50,000/cells/well) of purified CD4+CD25+ cells from LMC or STAT5b-CA mice were added to CD4+CD25− cultures, resulting in CD4+CD25+/CD4+/CD25− ratios that ranged from 1/27 to 1/1. Proliferation assays were conducted as described above. Results are plotted as the percent proliferation relative to proliferation of LMC CD4+CD25− T cells stimulated with APC plus anti-CD3 alone. □, LMC CD4+CD25− plus LMC CD4+CD25+ cells; ▪, LMC CD4+CD25− plus STAT5b-CA CD4+CD25+ cells. Data are the mean ± SD of triplicate measurements. Shown is a representative of three separate experiments. We found hyporesponsiveness to CD3 stimulation to be rather surprising, given the large increase in CD8+ T cells in STAT5b-CA mice. One potential explanation for these findings is that the CD4+CD25+ T cells in STAT5b-CA mice might be acting to suppress the proliferation of CD8+ and nonregulatory CD4+ T cells. To pursue this issue further, we purified CD8+ T cells from LMC and STAT5b-CA mice and repeated the proliferation assay on these T cell subsets. 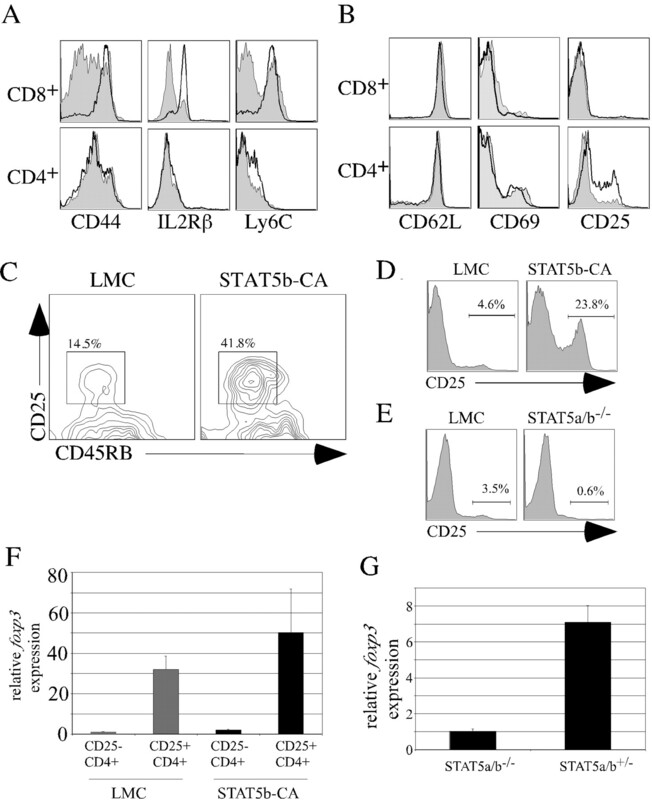 Purified CD8+ T cells from STAT5b-CA mice proliferated significantly better than LMC cells when stimulated with IL-2, IL-7, or IL-15 alone (Fig. 6⇑C). Moreover, STAT5b-CA CD8+ T cells also proliferated significantly better than LMC CD8+ T cells following TCR engagement (Fig. 6⇑C), suggesting that whole splenocytes contain an inhibitory factor or cell type that restrains CD8+ T cell proliferation. Given the large increase in foxp3-expressing CD4+CD25+ T cells in STAT5b-CA mice, we directly tested these cells for the ability to inhibit the proliferation of wild-type CD4+ T cells. This was done by stimulating CD4+CD25− T cells from wild-type mice with APCs plus anti-CD3 Abs, and then measuring cell proliferation. As shown in Fig. 6⇑D, addition of CD4+CD25+ T cells from either LMC or STAT5b-CA mice dramatically inhibited the proliferation of wild-type CD4+CD25− T cells. Inhibition was first observed at a CD4+CD25+/CD4+CD25− ratio of 1/9 (40–65% inhibition for LMC and STAT5b-CA T cells, respectively) and reached a maximum of 80–90% inhibition at a CD4+CD25+/CD4+CD25− ratio of 1/1. Thus, STAT5 activation in CD4+ T cells promotes the development and/or persistence of CD4+CD25+CD45RBlow foxp3-expressing T cells, which potently suppress the proliferation of wild-type CD4+ T cells. Cytokines have been shown to play a key role in the homeostasis of virtually all lymphocyte subsets. However, the signaling pathways that govern this process have not been well characterized. Herein, we demonstrate that the STAT5 signaling pathway plays a central role in this process. First, we observed that STAT5 activation in B cells leads to a dramatic expansion of progenitor B cells and, to a lesser extent, immature B cells. Mature B cells appear unaffected, however, suggesting that STAT5 activation is not sufficient to over-ride the regulatory pathways that limit the number of these cells in the periphery. Hence, STAT5 primarily affects early B cell development and not mature B cell homeostasis. Second, we observed that mature γδ and NK T cells are expanded in STAT5b-CA transgenic mice. Although additional characterization of these populations will be required, our preliminary results confirm the role of STAT5 in regulating γδ T cell development in vivo. Furthermore, they point to a key role for this pathway in promoting the survival or development of NK T cells, most likely acting downstream of the IL-15R. Finally, and most strikingly, we observed profound, but quite distinct, effects on the homeostasis of CD8+ and CD4+ αβ T cells, leading to cytokine-independent homeostatic proliferation of naive CD8+ T cells and expansion of CD4+CD25+ regulatory T cells. Recent studies have clearly documented that IL-7 is the critical cytokine involved in governing the homeostasis of naive T cells in vivo (11, 13). However, the signaling pathways activated by IL-7 that entrain this process have not yet been established. Most studies have focused on the role of pro- and antiapoptotic regulators of the bcl-2 family and their potential induction by the PI3K/Akt signal transduction cascade (3, 32). For example, it has been well documented that several γc-using cytokine receptors (including those for IL-2 and IL-7) induce PI3K and Akt activation following ligand binding (52, 53); this pathway has the potential to impact lymphocyte survival through up-regulation of bcl-2 (54), sequestration of Bad (55, 56), and promotion of glucose metabolism (57, 58). Furthermore, PI3K/Akt-dependent signals can promote T cell proliferation by down-regulating the cell cycle inhibitor p27kip and up-regulating the family of E2F transcription factors (52). However, specific activation of these pathways in T cells does not reproduce the events that occur during homeostatic expansion. For example, mice that express a constitutively active Akt transgene in T cells or lack the phosphatase gene PTEN (a negative regulator of PI3K signaling) display dramatic increases in T cell numbers (54, 59). However, these lymphocytes also display an activated phenotype characterized by up-regulation of CD25 and CD69 and down-regulation of CD62L, markers that are not modulated on cells undergoing classical homeostatic expansion. Furthermore, CD8+ T cells expressing a bcl-2 transgene do not undergo homeostatic expansion when transferred into lymphopenic mice that lack IL-7 (IL-7−/−), indicating that ectopic expression of Bcl-2 is not sufficient to initiate homeostatic expansion in the absence of other signals provided by IL-7 (13). Similarly, mice that lack both the proapoptotic genes bax and bak show a prominent accumulation of CD4+ and CD8+ T cells. These cells express high levels of the activation marker CD44, but low levels of CD62L, suggesting that the expansion in cell numbers results from a failure to eliminate Ag-activated T cells, not from the induction of homeostatic expansion (60). Thus, no signal transduction pathways have been identified to this point that can functionally substitute for IL-7 or IL-15 in either the induction or the maintenance of homeostatic expansion of naive T cells. Our studies demonstrate that STAT5 activation is the key event downstream of IL-7 that leads to homeostatic proliferation of naive CD8+ T cells. First, STAT5 activation leads to a pronounced expansion of CD8+ T cells. This increase in CD8+ T cell numbers is not simply due to deregulated cell cycle control, since STAT5b-CA CD8+ T cells do not proliferate spontaneously in culture; hence, they must require additional external signals before entering the cell cycle. In vivo, these signals are most likely provided by basal TCR or cytokine signals. Second, CD8+ T cells from STAT5b-CA mice exhibit the same alteration in cell surface marker expression as wild-type CD8+ T cells undergoing homeostatic expansion. Such phenotypic changes are not seen when altering PI3K or its downstream target, Akt. Third, and most significantly, STAT5 activation is sufficient to induce homeostatic proliferation of naive CD8+ T cells in the absence of IL-7. This result is not simply due to STAT5 activation converting CD8+ T cells to IL-15-responsive memory-like cells, as homeostatic proliferation is also initiated in IL-7−/− × IL-15−/− mice. Thus, while other signaling pathways may contribute to IL-7/IL-15-dependent CD8+ T cell homeostatic proliferation, they are neither required nor sufficient to induce this process. Although STAT5b-CA expression is clearly sufficient to induce homeostatic proliferation of CD8+ T cells in the absence of cytokine signaling, we observed more robust proliferation in the presence of IL-7 or IL-15. We believe that there are two explanations for this result. First, IL-7/IL-15 stimulation can still lead to the activation of endogenous STAT5 proteins; this should result in a more potent STAT5 signal, since it is derived from the sum of STAT5b-CA signals plus activated, endogenous STAT5 signals. Second, STAT5b-CA activation still requires phosphorylation of Tyr699, suggesting that activation occurs due to stochastic phosphorylation of this amino acid coupled by a failure of negative regulatory pathways to dephosphorylate this residue. Low level cytokine stimulation might then be expected to accelerate the accumulation of phosphorylated, and hence active, STAT5b-CA. In the absence of both IL-7 and IL-15, we would expect STAT5b-CA activation to occur more slowly, thus accounting for the reduced numbers of cells that initiate homeostatic proliferation. Consistent with this hypothesis, Cornish and colleagues (61) have observed that deletion of SOCS-1, a negative regulator of multiple STAT family members, results in a phenotype similar to that seen in STAT5b-CA transgenic mice, with pronounced expansion of CD8+ T cells that display memory-like surface markers. Naive CD4+ T cells have also been reported to require IL-7 signaling for homeostatic proliferation. However, in contrast to the results observed with CD8+ T cells, STAT5b-CA CD4+ T cells do not show signs of homeostatic proliferation. Specifically, the number of CD4+CD25− T cells is only slightly increased (1.8-fold increase). In addition, we observe only limited changes in cell surface markers on all CD4+ T cells. This demonstrates a striking discrepancy between signals required to induce homeostatic expansion in CD4+ T cells compared with CD8+ T cells. Although the reasons for this difference are currently unclear, several potential explanations are feasible. First, CD4+ T cells may simply require additional signals to undergo homeostatic proliferation compared with CD8+ T cells. For example, CD4+ T cells may show more stringent requirements for signals mediated by the PI3K pathway to promote proliferation and/or survival. Second, STAT5 activation in CD4+ T cells may lead to enhanced apoptosis of such cells following TCR stimulation. Such an effect has been observed in CD4+ T cells that overexpress wild-type STAT5b (38). Third, CD4+CD25+ regulatory T cells may selectively limit the proliferation of CD4+CD25− STAT5b-CA T cells. This possibility seems unlikely, since CD4+ regulatory T cells have previously been shown to inhibit both CD4+ and CD8+ T cell proliferation (62). Future studies will be required to more precisely dissect these distinct possibilities. Perhaps the most interesting result observed in our studies of STAT5b-CA mice is the marked expansion of CD4+CD25+ T cells. One explanation for this finding is that STAT5 may simply bind to the CD25 promoter and thereby promote increased CD25 transcription. Supporting this conjecture, STAT5 binding sites have been found in the CD25 promoter and have been shown to promote CD25 up-regulation following TCR stimulation (63, 64). Conversely, STAT5 is clearly not universally required for CD25 expression, as DN thymocytes from STAT5a/b−/− mice express CD25 at identical levels to those seen in LMC mice (M. A. Burchill and M. A. Farrar, unpublished observations). We propose that an alternative explanation for our results is that STAT5 activation in CD4+ T cells leads to the selective expansion or enhanced survival of CD4+CD25+ regulatory T cells. Several pieces of evidence support this hypothesis. First, if STAT5 binding is sufficient to induce CD25, we would expect to see increased CD25 expression in all CD4+ T cells, not just a subset. Second, CD8+ T cells express equal amounts of STAT5b-CA, yet CD25 expression is not changed in these cell types; clearly, STAT5 activation alone is not sufficient to induce CD25 levels. Third, CD4+CD25+ T cells also express lower levels of CD45RB, an additional marker of CD4+ regulatory T cells. No evidence exists to suggest that STAT5b directly regulates CD45RB expression levels. Thus, the reciprocal up-regulation of CD25 and down-regulation of CD45RB suggest that the CD4+CD25+ T cells observed in STAT5b-CA mice are regulatory T cells. Fourth, CD4+CD25+ T cells in STAT5b-CA mice express the key transcription factor foxp3 at levels greater than or equal to those in wild-type CD4+CD25+ T cells. This finding strongly supports our hypothesis that STAT5b-CA CD4+CD25+ T cells are regulatory T cells, since this transcription factor has been reported to uniquely mark this cell population. Furthermore, elevated foxp3 expression has been shown to directly induce regulatory T cell development (40, 47, 48). Fifth, CD4+ T cells in STAT5b-CA transgenic mice suppress TCR-stimulated CD8+ T cell proliferation (Fig. 6⇑, A–C). Importantly, this suppression could be reversed by IL-2 addition. This suggests that the mechanism of inhibition is similar to that previously reported for regulatory T cells, which act by preventing IL-2 transcription (65, 66). In addition, STAT5b-CA CD8+ T cells, despite their enhanced proliferative potential, do not expand continuously in vivo. We believe that this reflects a new equilibrium between enhanced CD8+ T cell proliferation and increased numbers of CD4+CD25+ regulatory T cells in STAT5b-CA mice. Sixth, and most importantly, CD4+CD25+ T cells from STAT5b-CA mice suppress the proliferation of wild-type CD4+ T cells (Fig. 6⇑D). Based on these results we propose that STAT5 activation plays a key role in the development or survival of CD4+CD25+ regulatory T cells. A key question remains as to whether STAT5 activation enhances the development of CD4+CD25+ T cells in the thymus or promotes the survival of mature CD4+CD25+ T cells in the periphery. Results from STAT5b-CA mice indicate that CD4+ SP thymocytes show a large increase in the percentage of CD4+CD25+ T cells compared with wild-type mice. Conversely, examination of STAT5a/b−/− mice showed a dramatic decrease in CD4+CD25+ thymocytes. These findings suggest that STAT5 plays a key role in the development of CD4+CD25+ regulatory T cells; however, they do not exclude the possibility that STAT5 enhances the proliferation or survival of mature CD4+CD25+ T cells as well. For example, we have observed that in freshly isolated STAT5b-CA CD4+CD25+ T cells there is an increase in the percentage of cells in the S/G2/M phases of the cell cycle relative to LMC CD4+CD25+ T cells (20 vs 12%, respectively; data not shown). We are currently crossing STAT5b-CA mice to IL-2−/− and IL2Rβ−/− mice to determine whether activation of the STAT5 pathway is indeed sufficient to rescue the development of regulatory T cells in those mice (which typically lack such cells). Additional studies in which mature STAT5b-CA CD4+CD25+ T cells are transferred into IL-2−/− mice should help to address whether STAT5 activation also prolongs survival or enhances the proliferation of regulatory CD4+ T cells. Future studies will be necessary to determine whether STAT5b-CA CD4+CD25+ T cells exert suppressive activity via cytokine secretion (such as IL-10 or TGF-β), contact-dependent inhibition, or a combination of these mechanisms. We believe that our results also provide a basis for understanding some of the puzzling phenotypes displayed by mice that lack either STAT5a and STAT5b or the upstream activator Janus kinase 3. Such mice possess CD4+ and CD8+ T cells that are uniformly activated (CD69high, CD62Llow, CD44high) ((37, 67, 68) and M. A. Burchill, C. A. Goetz, and M. A. Farrar, unpublished observations) despite profound deficiencies in TCR-dependent proliferation. Similar findings have been reported in mice lacking the γc (69). We suggest that disruption of the STAT5 signaling pathway leads to the absence of CD4+CD25+ regulatory T cells, thereby allowing the unchecked development of activated CD4+ and CD8+ T cells. Similarly, mice lacking either IL-2 or other components of the IL-2R (CD25 or CD122) lack CD4+CD25+ regulatory T cells and develop profound autoimmune syndromes characterized by extensive T cell activation (28, 29, 30). Our results suggest that IL-2 may promote CD4+CD25+ T cell development or survival via activation of STAT5. Interestingly, recent results by Bensinger and colleagues (unpublished observations) strongly support this hypothesis. They (and others) have previously observed that IL-2 stimulation of CD4+CD25− T cells activates a number of signaling pathways, including those involving Akt and STAT5 (70, 71). In contrast, they demonstrate that CD4+CD25+ T cells no longer activate the Akt pathway following IL-2 stimulation; these cells uniquely induce STAT5 activation (S. J. Bensinger and L. A. Turka, unpublished observations). Taken together with our observation that STAT5a/b−/− CD4+ T cells show dramatically decreased foxp3 expression, these results suggest that STAT5 activation is both necessary and sufficient for CD4+CD25+ T cell development and survival. In addition to illuminating the role of STAT5 in lymphocyte homeostasis, STAT5b-CA mice should be useful for further probing the role of STAT5 in immune responses. For example, identification of the STAT5 pathway as a key player in CD4+CD25+ T cell development or maintenance suggests that therapies directed at promoting STAT5 activation in CD4+ or CD4+CD25+ T cells may be useful for suppressing ongoing autoimmune diseases. In addition, the availability of a mouse model that expresses large numbers of CD4+CD25+ regulatory T cells should facilitate study of this typically rare cell lineage. Furthermore, the finding that STAT5 promotes the expansion of naive CD8+ T cells and the conversion of such cells into memory CD8+ T cells suggests that approaches aimed at promoting STAT5 activation in CD8+ T cells may allow for the development of more potent vaccination strategies. Clearly, a better understanding of STAT5 target genes in both CD4+ and CD8+ T cells would facilitate such efforts, and this is currently an area of ongoing investigation. We thank Dr. Alice Mui for providing the STAT5b cDNA, Drs. James Ihle and David Largaespada for providing STAT5a/b−/− mice, the Mouse Genetics Laboratory for production of STAT5b-CA transgenic mice, Greg Veltri for assistance with flow cytometry, Melinda Berthold and Dr. Angela Panoskaltsis of the Cytokine Reference Laboratory for assistance with measuring cytokine serum levels, and Drs. Erik Peterson, Anne Norment, and Marion Collins for helpful discussions and critical review of the manuscript. ↵1 This work was supported by grants from the National Institutes of Health (AI05737), the Concern Foundation, and the Minnesota Medical Foundation and a Pew Scholar Award (to M.A.F. ); the Leukemia Research Fund, United Kingdom (to P.B. ); and National Institutes of Health Grant AI43620 (to L.A.T.). M.A.B. and C.A.G. were partially supported by a gift from the estate of Eli and Dorothy Rosen and Bernard Collins. ↵3 Abbreviations used in this paper: γc, common γ-chain; DN, double negative; HPRT, hypoxanthine phosphoribosyltransferase; LMC, littermate control; PI3K, phosphatidylinositol 3-kinase; rag-2, recombinase-activating gene-2; SP, single positive. Marrack, P., J. Bender, D. Hildeman, M. Jordan, T. Mitchell, M. Murakami, A. Sakamoto, B. C. Schaefer, B. Swanson, J. Kappler. 2000. Homeostasis of αβ TCR+ T cells. Nat. Immunol. 1:107. Freitas, A. A., B. Rocha. 2000. Population biology of lymphocytes: the flight for survival. Annu. Rev. Immunol. 18:83. Khaled, A. R., S. K. Durum. 2002. Lymphocide: cytokines and the control of lymphoid homeostasis. Nat. Rev. Immunol. 2:817. Jameson, S. C.. 2002. Maintaining the norm: T-cell homeostasis. Nat. Rev. Immunol. 2:547. Kieper, W. C., S. C. Jameson. 1999. Homeostatic expansion and phenotypic conversion of naive T cells in response to self peptide/MHC ligands. Proc. Natl. Acad. Sci. USA 96:13306. Bender, J., T. Mitchell, J. Kappler, P. Marrack. 1999. CD4+ T cell division in irradiated mice requires peptides distinct from those responsible for thymic selection. J. Exp. Med. 190:367. Goldrath, A. W., M. J. Bevan. 1999. Low-affinity ligands for the TCR drive proliferation of mature CD8+ T cells in lymphopenic hosts. Immunity 11:183. Ernst, B., D. S. Lee, J. M. Chang, J. Sprent, C. D. Surh. 1999. The peptide ligands mediating positive selection in the thymus control T cell survival and homeostatic proliferation in the periphery. Immunity 11:173. Oehen, S., K. Brduscha-Riem. 1999. Naive cytotoxic T lymphocytes spontaneously acquire effector function in lymphocytopenic recipients: a pitfall for T cell memory studies?. Eur. J. Immunol. 29:608. Cho, B. K., V. P. Rao, Q. Ge, H. N. Eisen, J. Chen. 2000. Homeostasis-stimulated proliferation drives naive T cells to differentiate directly into memory T cells. J. Exp. Med. 192:549. Vivien, L., C. Benoist, D. Mathis. 2001. T lymphocytes need IL-7 but not IL-4 or IL-6 to survive in vivo. Int. Immunol. 13:763. Schluns, K. S., W. C. Kieper, S. C. Jameson, L. Lefrancois. 2000. Interleukin-7 mediates the homeostasis of naive and memory CD8 T cells in vivo. Nat. Immunol. 1:426. Tan, J. T., E. Dudl, E. LeRoy, R. Murray, J. Sprent, K. I. Weinberg, C. D. Surh. 2001. IL-7 is critical for homeostatic proliferation and survival of naive T cells. Proc. Natl. Acad. Sci. USA 98:8732. Schluns, K. S., K. Williams, A. Ma, X. X. Zheng, L. Lefrancois. 2002. Cutting edge: requirement for IL-15 in the generation of primary and memory antigen-specific CD8 T cells. J. Immunol. 168:4827. Goldrath, A. W., P. V. Sivakumar, M. Glaccum, M. K. Kennedy, M. J. Bevan, C. Benoist, D. Mathis, E. A. Butz. 2002. Cytokine requirements for acute and basal homeostatic proliferation of naive and memory CD8+ T cells. J. Exp. Med. 195:1515. Becker, T. C., E. J. Wherry, D. Boone, K. Murali-Krishna, R. Antia, A. Ma, R. Ahmed. 2002. Interleukin 15 is required for proliferative renewal of virus-specific memory CD8 T cells. J. Exp. Med. 195:1541. Boursalian, T. E., K. Bottomly. 1999. Survival of naive CD4 T cells: roles of restricting versus selecting MHC class II and cytokine milieu. J. Immunol. 162:3795. Lantz, O., I. Grandjean, P. Matzinger, J. P. Di Santo. 2000. Gamma chain required for naive CD4+ T cell survival but not for antigen proliferation. Nat. Immunol. 1:54. He, Y. W., T. R. Malek. 1996. Interleukin-7 receptor α is essential for the development of γδ + T cells, but not natural killer cells. J. Exp. Med. 184:289. Moore, T. A., U. von Freeden-Jeffry, R. Murray, A. Zlotnik. 1996. Inhibition of γδ T cell development and early thymocyte maturation in IL-7−/− mice. J. Immunol. 157:2366. Maki, K., S. Sunaga, Y. Komagata, Y. Kodaira, A. Mabuchi, H. Karasuyama, K. Yokomuro, J. I. Miyazaki, K. Ikuta. 1996. Interleukin 7 receptor-deficient mice lack γδ T cells. Proc. Natl. Acad. Sci. USA 93:7172. Ohteki, T., S. Ho, H. Suzuki, T. W. Mak, P. S. Ohashi. 1997. Role for IL-15/IL-15 receptor β-chain in natural killer 1.1+ T cell receptor-αβ+ cell development. J. Immunol. 159:5931. Kennedy, M. K., M. Glaccum, S. N. Brown, E. A. Butz, J. L. Viney, M. Embers, N. Matsuki, K. Charrier, L. Sedger, C. R. Willis, et al 2000. Reversible defects in natural killer and memory CD8 T cell lineages in interleukin 15-deficient mice. J. Exp. Med. 191:771. Sadlack, B., J. Lohler, H. Schorle, G. Klebb, H. Haber, E. Sickel, R. J. Noelle, I. Horak. 1995. Generalized autoimmune disease in interleukin-2-deficient mice is triggered by an uncontrolled activation and proliferation of CD4+ T cells. Eur. J. Immunol. 25:3053. Suzuki, H., T. M. Kündig, C. Furlonger, A. Wakeham, E. Timms, T. Matsuyama, R. Schmits, J. J. L. Simard, P. S. Ohashi, H. Griesser, et al 1995. Deregulation T cell activation and autoimmunity in mice lacking interleukin-2 receptor β. Science 268:1472. Willerford, D. M., J. Chen, J. A. Ferry, L. Davidson, A. Ma, F. W. Alt. 1995. Interleukin-2 receptor α chain regulates the size and content of the peripheral lymphoid compartment. Immunity 3:521. Plas, D. R., J. C. Rathmell, C. B. Thompson. 2002. Homeostatic control of lymphocyte survival: potential origins and implications. Nat. Immunol. 3:515. Bunting, K. D., H. L. Bradley, T. S. Hawley, R. Moriggl, B. P. Sorrentino, J. N. Ihle. 2002. Reduced lymphomyeloid repopulating activity from adult bone marrow and fetal liver of mice lacking expression of STAT5. Blood 99:479. Snow, J. W., N. Abraham, M. C. Ma, N. W. Abbey, B. Herndier, M. A. Goldsmith. 2002. STAT5 promotes multilineage hematolymphoid development in vivo through effects on early hematopoietic progenitor cells. Blood 99:95. Kelly, J., R. Spolski, K. Imada, J. Bollenbacher, S. Lee, W. J. Leonard. 2003. A role for stat5 in CD8+ T cell homeostasis. J. Immunol. 170:210. Khattri, R., T. Cox, S. A. Yasayko, F. Ramsdell. 2003. An essential role for Scurfin in CD4+CD25+ T regulatory cells. Nat. Immunol. 4:337. Farrar, M. A., J. Tian, R. M. Perlmutter. 2000. Membrane localization of raf assists engagement of downstream effectors. J. Biol. Chem. 275:31318. Ye, S. K., K. Maki, T. Kitamura, S. Sunaga, K. Akashi, J. Domen, I. L. Weissman, T. Honjo, K. Ikuta. 1999. Induction of germline transcription in the TCRγ locus by Stat5: implications for accessibility control by the IL-7 receptor. Immunity 11:213. Shevach, E. M.. 2000. Regulatory T cells in autoimmmunity. Annu. Rev. Immunol. 18:423. Fontenot, J. D., M. A. Gavin, A. Y. Rudensky. 2003. Foxp3 programs the development and function of CD4+CD25+ regulatory T cells. Nat. Immunol. 4:330. Seddon, B., R. Zamoyska. 2002. TCR and IL-7 receptor signals can operate independently or synergize to promote lymphopenia-induced expansion of naive T cells. J. Immunol. 169:3752. Domen, J., N. M. van der Lugt, D. Acton, P. W. Laird, K. Linders, A. Berns. 1993. Pim-1 levels determine the size of early B lymphoid compartments in bone marrow. J. Exp. Med. 178:1665.
del Peso, L., M. Gonzalez-Garcia, C. Page, R. Herrera, G. Nunez. 1997. Interleukin-3-induced phosphorylation of BAD through the protein kinase Akt. Science 278:687. Rathmell, J. C., E. A. Farkash, W. Gao, C. B. Thompson. 2001. IL-7 enhances the survival and maintains the size of naive T cells. J. Immunol. 167:6869. Plas, D. R., C. B. Thompson. 2002. Cell metabolism in the regulation of programmed cell death. Trends Endocrinol. Metab. 13:75. Rathmell, J. C., T. Lindsten, W. X. Zong, R. M. Cinalli, C. B. Thompson. 2002. Deficiency in Bak and Bax perturbs thymic selection and lymphoid homeostasis. Nat. Immunol. 3:932. Cornish, A. L., G. M. Davey, D. Metcalf, J. F. Purton, J. E. Corbin, C. J. Greenhalgh, R. Darwiche, L. Wu, N. A. Nicola, D. I. Godfrey, et al 2003. Suppressor of cytokine signaling has IFN-γ independent actions in T-cell homeostasis. J. Immunol. 170:475. Sohn, S. J., K. A. Forbush, N. Nguyen, B. Witthuhn, T. Nosaka, J. N. Ihle, R. M. Perlmutter. 1998. Requirement for Jak3 in mature T cells: its role in regulation of T cell homeostasis. J. Immunol. 160:2130. Thomis, D. C., L. J. Berg. 1997. Peripheral expression of Jak3 is required to maintain T lymphocyte function. J. Exp. Med. 185:197. Nakajima, H., E. W. Shores, M. Noguchi, W. J. Leonard. 1997. The common cytokine receptor γ chain plays an essential role in regulating lymphoid homeostasis. J. Exp. Med. 185:189. Cantrell, D. A., M. Izquierdo, K. Reif, M. Woodrow. 1993. Regulation of PtdIns-3-kinase and the guanine nucleotide binding proteins p21ras during signal transduction by the T cell antigen receptor and the interleukin-2 receptor. Semin. Immunol. 5:319. Nelson, B. H., D. M. Willerford. 1998. Biology of the interleukin-2 receptor. Adv. Immunol. 70:1.